Mario Kart 8 Deluxe, the Nintendo Switch version of the popular Nintendo racer, is coming to the Switch on April 28. Nintendo has finally let loose some additional details spelling out exactly what kind of new content we can expect to see from the game when it finally makes its debut on the latest console and handheld hybrid from the big N.
Mario Kart 8 Deluxe will include every character, track and kart that was previously included in the Wii U version, including every piece of DLC for sale, as well as some fun new surprises. For instance, it will include five new characters: Inkling Girl, Inkling Boy, King Boo, Dry Bones and Bowser Jr. 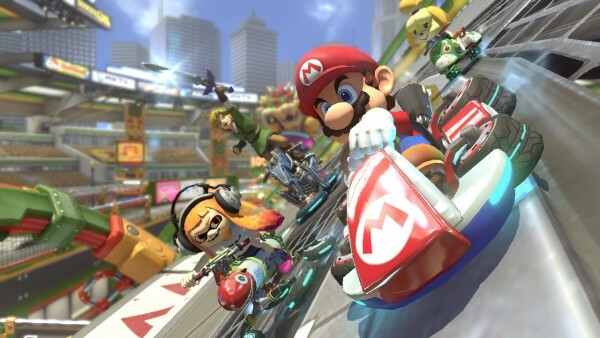 In addition to new characters, which bumps up the racer count to 42, new features include brand new karts inspired by Splatoon, the ability to hold two items at once, and a new Smart Steering control option. If you like playing with others, you'll want to check out the new Battle mode that can be enjoyed online and locally, as well as a smattering of new modes, such as Renegade Roundup. One team will try to capture the other and place them in "jail" before a timer runs out. Meanwhile, the other team will try to escape and break other teammates out. Balloon Battle is a returning favorite, where players have to pop the balloons on the back of other players' karts. Bob-omb Blast returns from Mario Kart: Double Dash! !, where players have to throw a whole bunch of Bob-ombs at others. Coin Runners has everyone racing to collect as many coins as possible (originally seen in Mario Kart Wii), and Shine Thief finds players looking to get the Shine Sprite and hold it til the count of 20. You'll be able to play all these modes with split-screen up to four players by using the Nintendo Switch in its docked mode, but you can also play with detached Joy-Con controllers. If you've got enough controllers (and players) handy, you can take part in 12-player LAN sessions too. Finally, when Mario Kart 8 Deluxe launches as a physical and digital release on April 28 for $59.99, Nintendo will also be putting out a special Joy-Con Wheel accessory for $14.99. It's an exciting time to be a Mario Kart fan!